A group of teacher educators researched their implementation of technology while trying to remain consonant with their philosophical frameworks. Four themes cut across the collected narratives. Commitment toward change describes the background attitudes and beliefs that propelled them to explore changes to their practice. Obstacles to using technology involved challenges in the teaching and learning environments. Struggles in using technology within instructional contexts highlights shared pedagogical concerns. Finally, attitudes toward technology use, outlines shifting understandings and their effect on their attitudes as teacher educators. Three conclusions emerged from the study. A match between the use of technology and the goals of instruction was necessary. Technology tended to make tasks more complicated, limiting the ability to incorporate technology into teaching. Perhaps more important than the exploration of technology as an instructional tool, however, was the insight gained into their own philosophies of teaching and learning through participation in the narrative of collaboration, and the ability to submit self-narratives for discussion by groups of colleagues. Strehle, E.L., Whatley, A., Kurz, K.A. & Hausfather, S.J. (2002). Narratives of Collaboration: Inquiring into Technology Integration in Teacher Education. Journal of Technology and Teacher Education, 10 (1), 27-47. Norfolk, VA: Society for Information Technology & Teacher Education. Retrieved April 23, 2019 from https://www.learntechlib.org/primary/p/8820/. Carter, K. (1993). The place of story in research on teaching and teacher education. Educational Researcher, 22 , 5-12. Elbaz , F. (1991). Research on teacher’s knowledge: The evolution of a discourse. Journal of CurriculumS tud ies , 23 (1) , 1-19. Fang, Z. (1996). A review of research on teacher beliefs and practice. Educational Researcher, 38(1) , 47-67. Guilfoyle , K. (1995). Constructing the meaning of teacher educator: The struggle to learn the roles. Teacher Education Quarterly, 22, 11-28. Hamilton, M.L. (1995). Confronting self: Passion and promise in the act of teaching or my Oz-dacious journey to Kansas! Teacher Education Quarterly, 22 , 29-44. Heilbrun, C.G. (1988). Writing a woman’s life. New York: Ballatine Books. Morgan, D.L. (1988). Focus groups as qualitative research. Newbury Park, CA: Sage. Force on Technology and Teacher Education (1997). Final Report. Washington, DC: Author. Placier , M. (1995). “But I have to have an A”: Probing the cultural meanings and ethical dilemmas of grades in teacher education. Teacher Education Quarterly, 22 , 45-64. Preskill , S. (1998). Narratives of teaching and the quest for the second self. Journal of Teacher Education, 49 , 5. Steffens, K. (1997). Learning with multimedia programs. 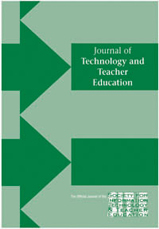 Journal of Information Technology for Teacher Education, 6 , 9-23. Thompson, B. (1993). Curriculum theory in action: A case of chi ldren’s literature in teacher education. Unpub l ished doctoral dissertation, University of Arizona.